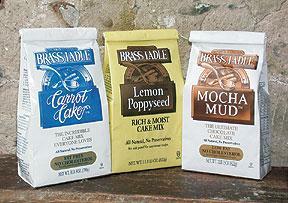 BRASS LADLE PRODUCTS has been making the best quality cake mixes for almost 30 years. The award-winning cake mixes are high-quality "from-scratch" cakes in a bag. The mixes are made with the finest all-natural ingredients available. They have no additives or preservatives. They are wonderful by themselves or you can add other ingredients to make your own creations. Cake artists and bakers love using our mixes. They admit, they can't make it better. All our mixes are Kosher--Parve. Kosher supervision and certification are provided by Kosher Technical Konsultants (www.koshertechnicalkonsultants.org). We make our mixes in small batches at our own plant to ensure freshness and consistency. BRASS LADLE CAKE MIXES started in our restaurant. We baked the carrot cake and mocha mud in the restaurant for years and years. One day a customer said, "...if you could only get this stuff in a bag." The rest is history!